Pictured above is sandstone displaying classic herringbone cross-beds. 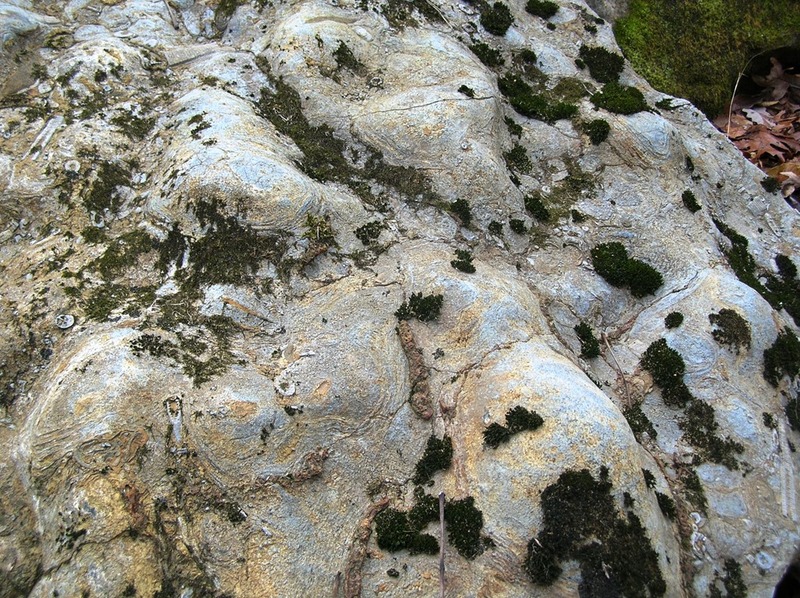 Cross-bedding results from either sediment transport by flowing water, such as in this example, or by wind flow, as in the case of dunes. 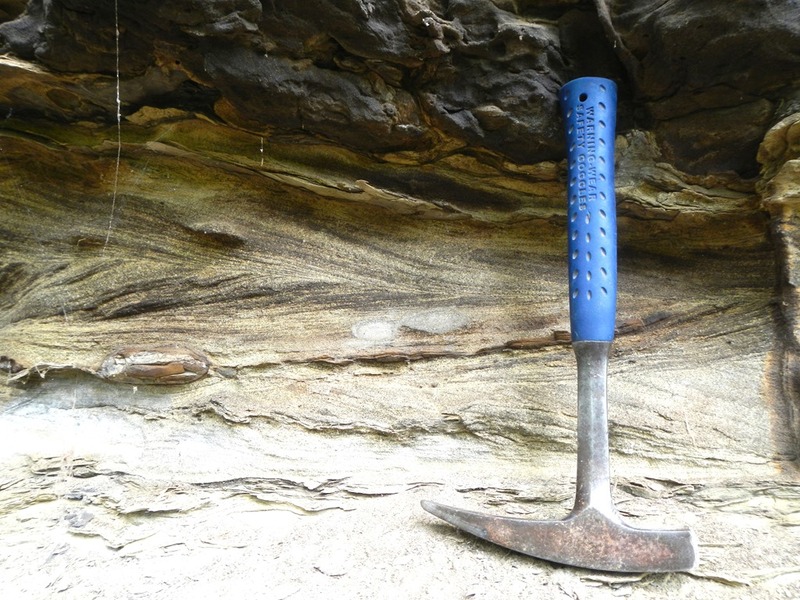 Cross-beds form by the migration of sediment, and tilt in the direction of flow. 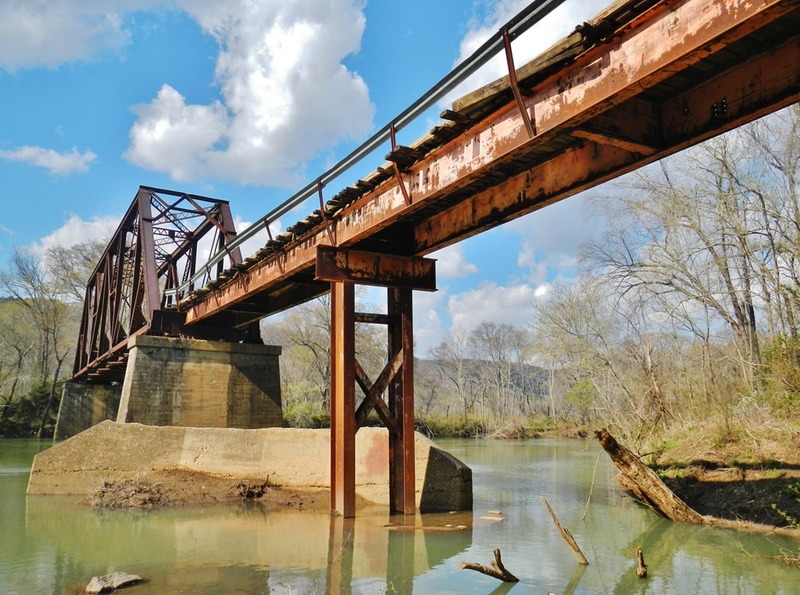 As sediment grains are carried by the current, they migrate up the gentle ramp of previously deposited cross-beds. 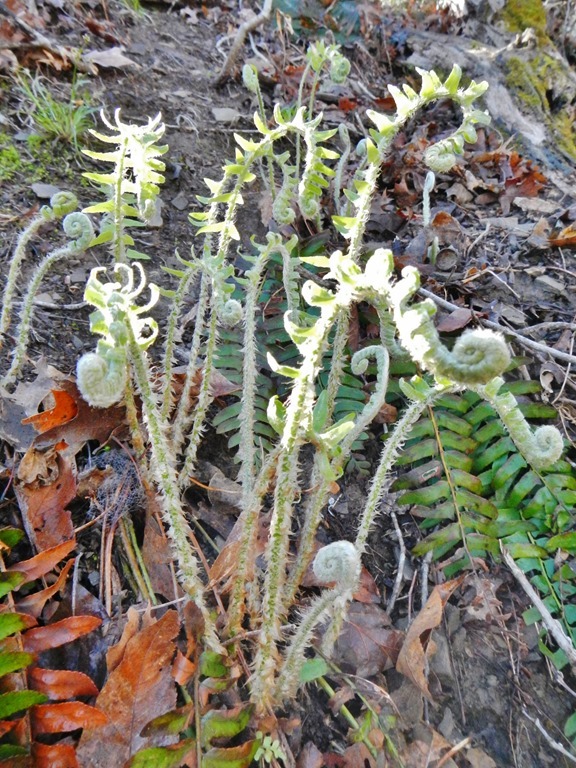 When they reach the end, they tumble down the steeper face there and are deposited to become part of the next cross-bed. In this way the sediment migrates in the downstream direction. Each group of similarly tilted cross-beds is known as a set. 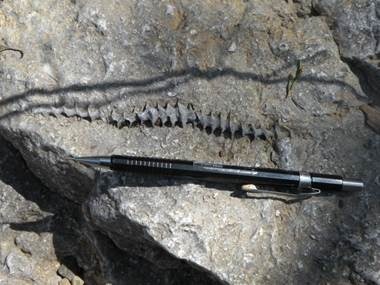 In herringbone cross-bedding, the sets are oriented contrarily, which gives the outcrop a fishbone appearance. These differently oriented cross-bed sets indicate changing flow directions. 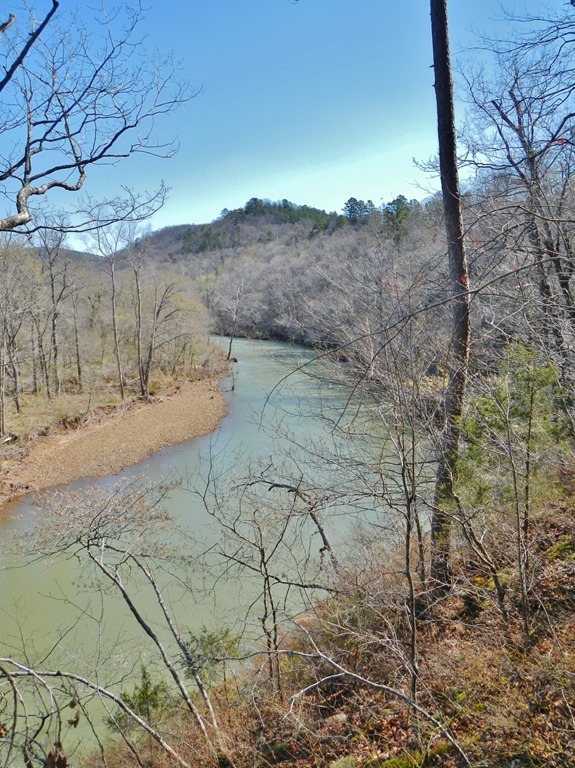 This entry was posted in #geoblog, GeoPic of the Week and tagged Arkansas, cross-bed set, cross-bedding, Fluvial, Geology, herringbone cross-bedding, sandstone, sedimentary structure on December 4, 2017 by argeology. 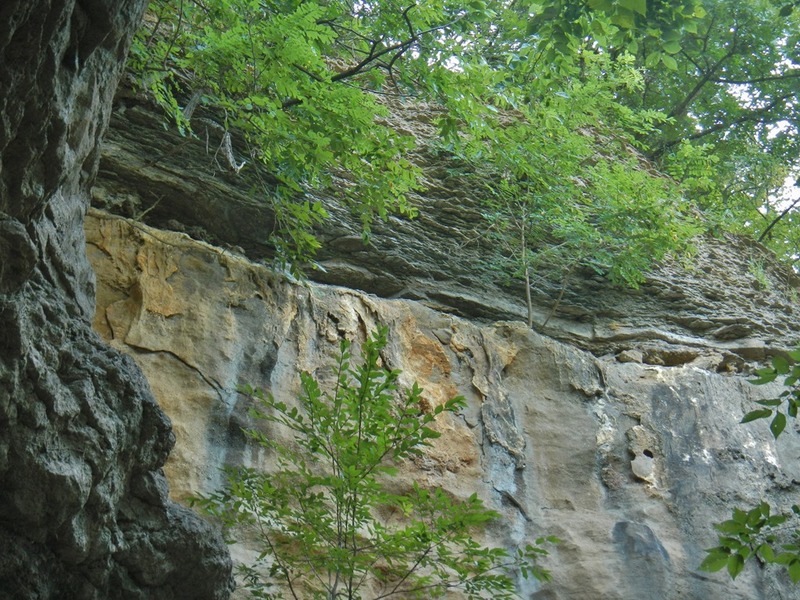 Pictured above is clay and sand of the Nacatoch Formation of southern Arkansas. 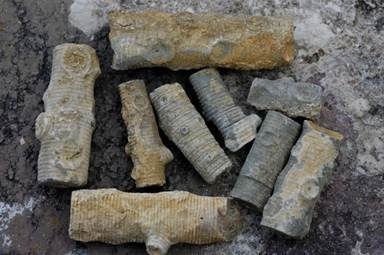 The clay beds, which stand slightly in relief, have been churned, and the sand has numerous cylindrical structures of various sizes. These are hallmarks of bioturbation, or reworking of sediment by living things. 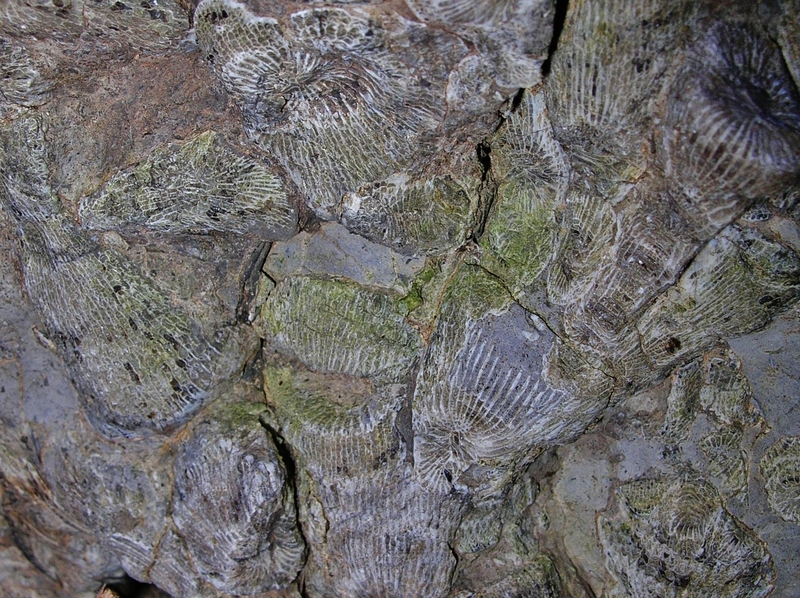 The cylindrical structures are the preserved casts of roots. 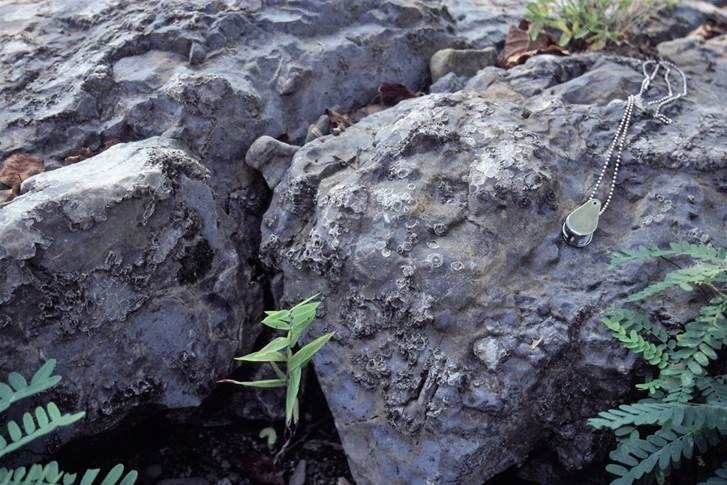 The disrupted clay beds are evidence of the burrowing of mud-loving critters. 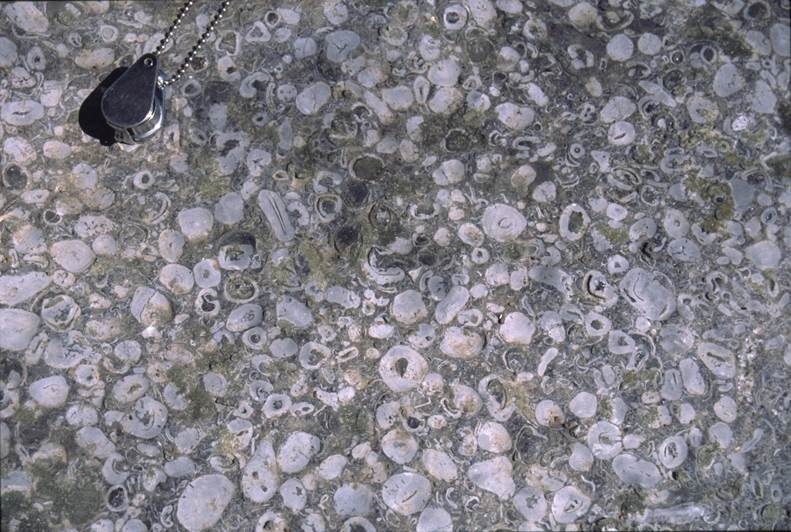 Bioturbation structures are commonly preserved in rock and offer glimpses into the environment where sediment was deposited. 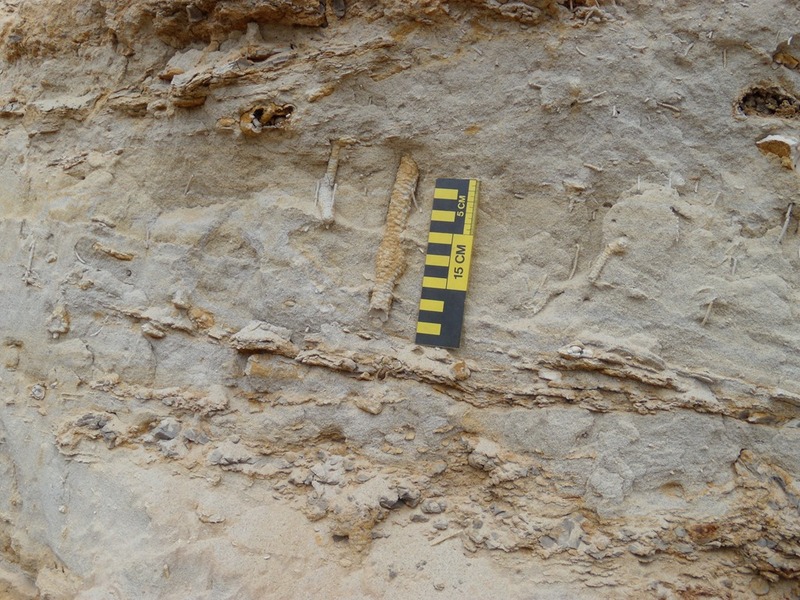 Specifically, it tells us that this sediment was near the surface in a relatively calm near-shore marine environment long enough after deposition for living organisms to move in and set up shop. 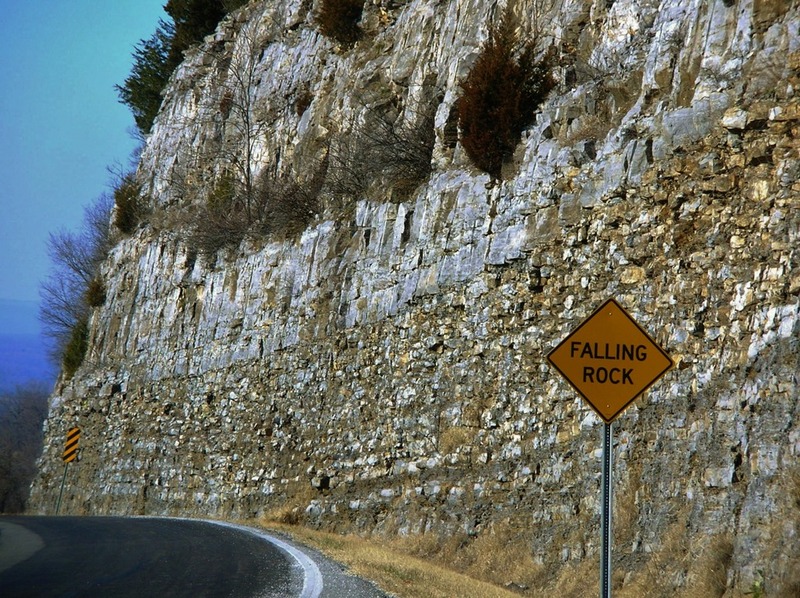 Clues like these are one of many tools geologists use to piece together the early history of the earth from the rock record. 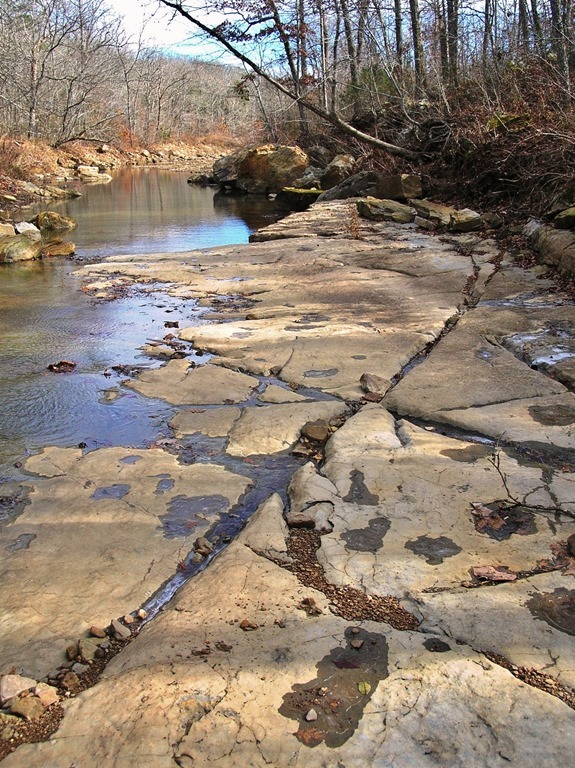 This entry was posted in #geoblog, GeoPic of the Week, Sedimentary Features and tagged Arkansas, bioturbation, clay, cretaceous, depositional environments, Geology, sand, sedimentary structure, sedimentology, stratigraphy on March 24, 2015 by argeology. 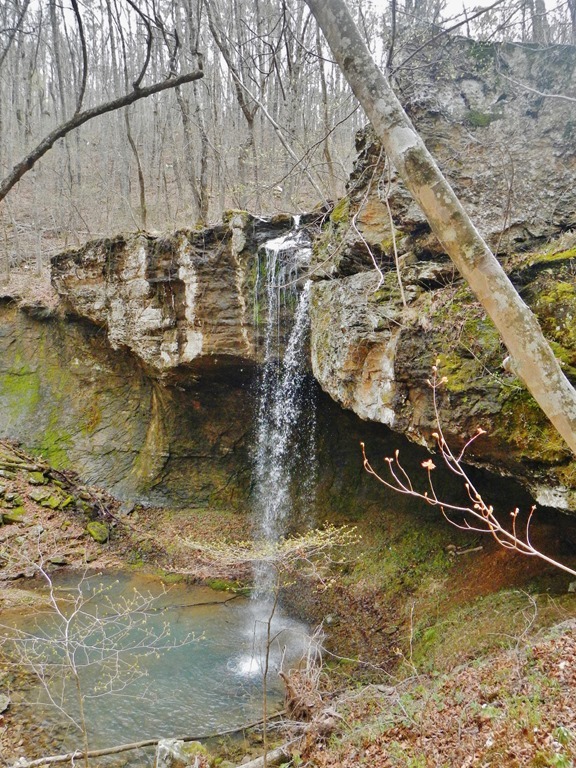 This is a “sandstone pipe” in the Witt Springs Formation of north central Arkansas. 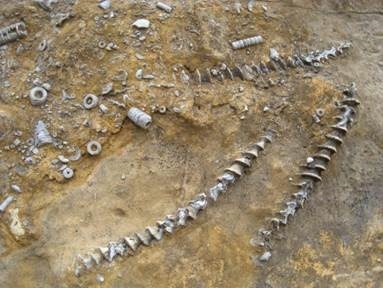 At first glance, it seems that someone has managed to insert a pipe into the outcrop (either that, or someone had fairly sophisticated plumbing 320 million years ago). Actually, these naturally occurring features result from iron minerals precipitating out of ground water as it moves through rock. 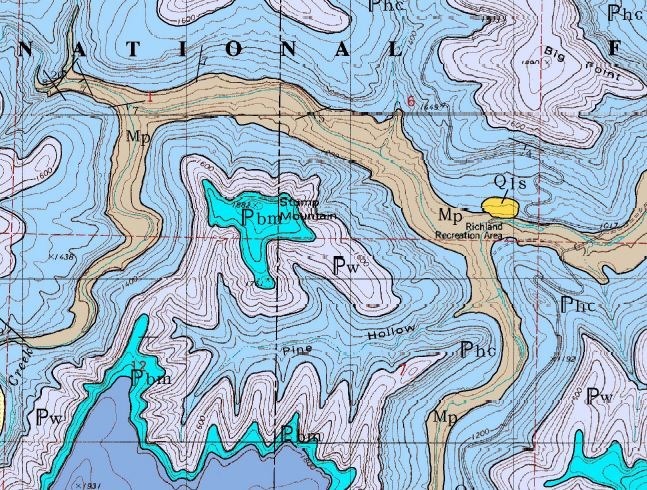 When minerals precipitate from a solution, they do so in concentric bands known as liesegang bands. They were named for Raphael Liesegang: the chemist that first produced them in the laboratory. Once the band of minerals has formed, it makes that part of the rock harder, and, as the rock erodes, the iron-fortified band stands out in relief. 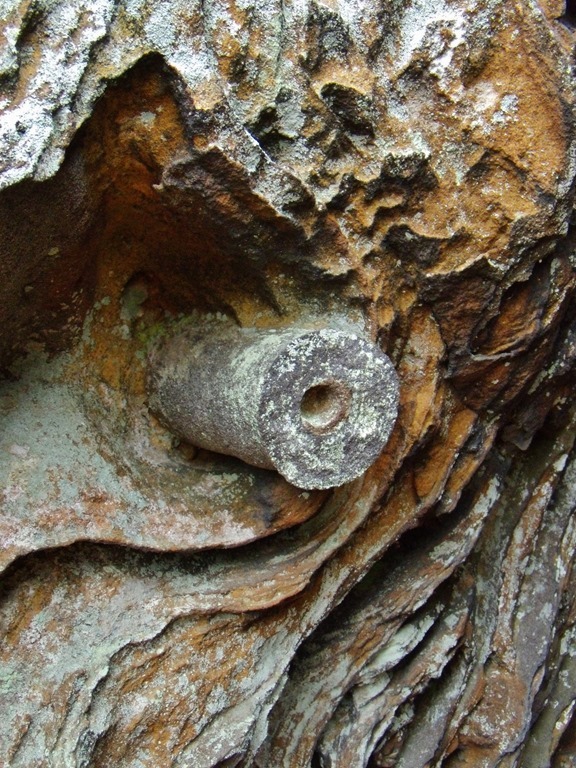 Typically liesegang bands form in organic shapes like the ones that surround the pipe above. 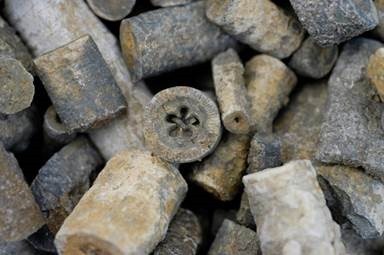 When they form a cylindrical band, however, they look almost identical to iron pipes. 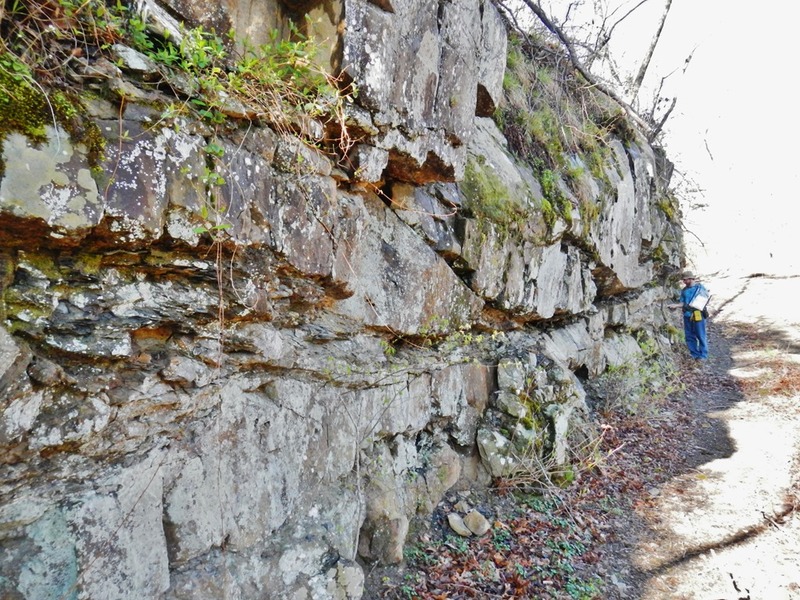 This entry was posted in #geoblog, GeoPic of the Week, Sedimentary Features and tagged Arkansas, diagenesis, Liesegang band, Pennsylvanian, sandstone, Sandstone Pipe, sedimentary rock, sedimentary structure, Witts Springs on February 19, 2015 by argeology. 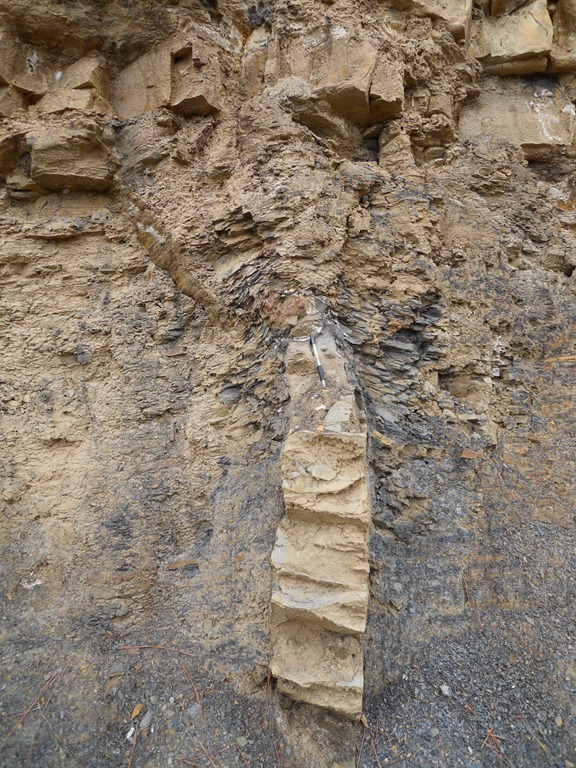 Pictured above is what geologists term an injection feature or sand dike. 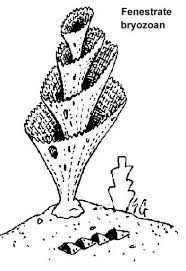 It formed when sand was violently forced upward into overlying clay before the sediment was cemented to form rock. In environments where sediment is accumulating very quickly, water can get trapped and buried in a sand body; as more sediment is deposited on top of the sand, the pressure causes the sand body to compress. When water erupts upward to relieve the pressure, it carries sand with it which fills the fissure created by the escaping water. 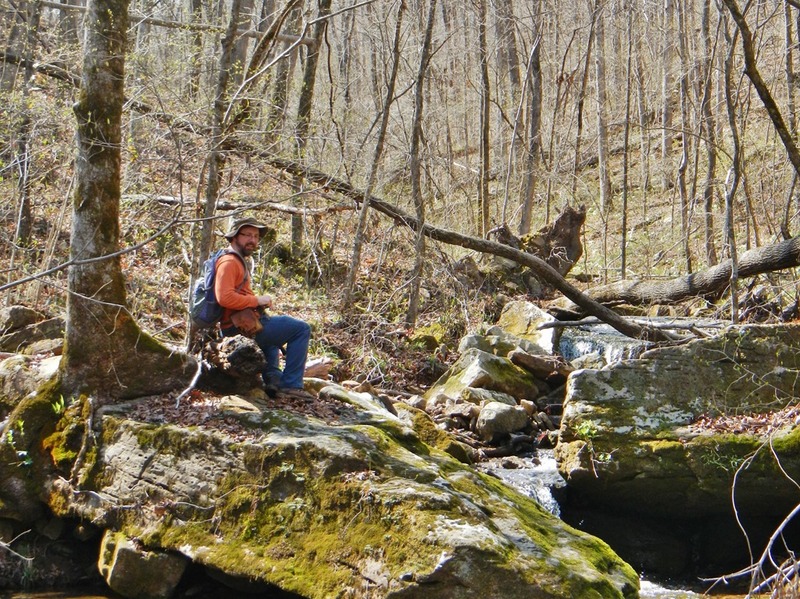 Geologists look for clues like injection features when trying to unravel the mystery of what conditions were like when a rock was deposited. 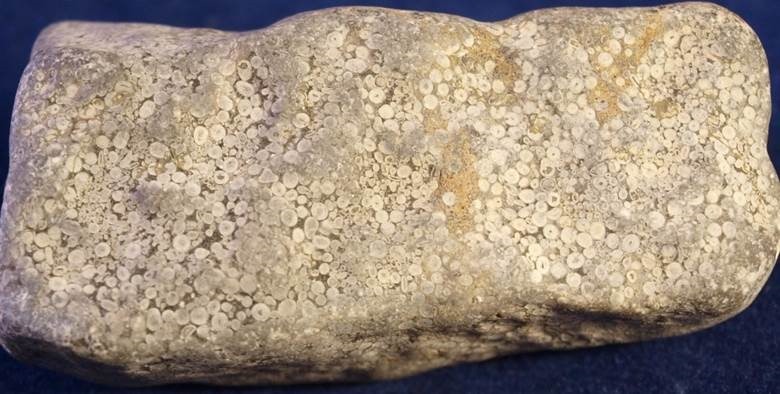 This particular rock is part of the Jackfork Formation which is exposed at the surface around Little Rock Arkansas and surrounding areas; it was deposited when the area was at the bottom of a deep ocean basin more than 300 million years ago. Ink pen is for scale. 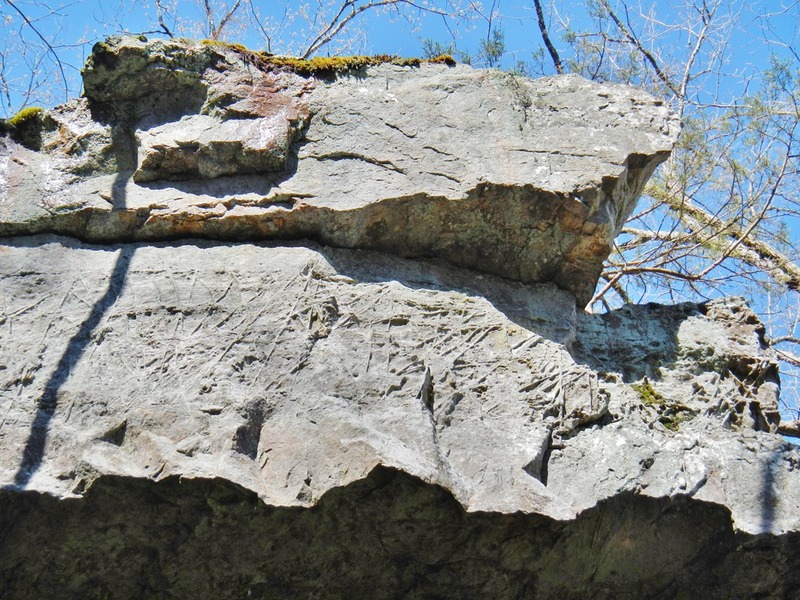 This entry was posted in #geoblog, GeoPic of the Week, Sedimentary Features and tagged injection feature, jackfork formation, Pennsylvanian, sand dike, sandstone, sedimentary structure, shale, tepee structure on January 9, 2015 by argeology. 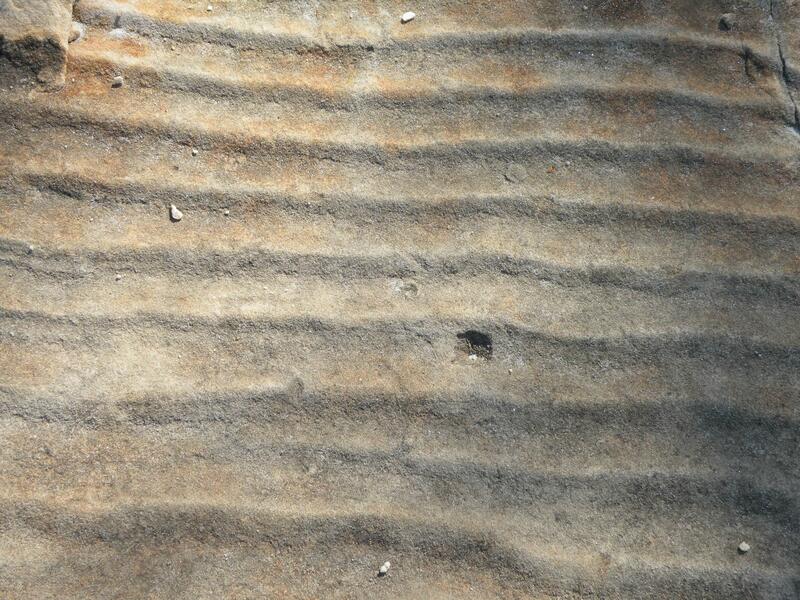 Ripple marks are sedimentary structures preserved in sandstone and limestone. They may be asymmetrical in shape, with the steep side pointing downstream in the direction of current flow. In this picture the steep side is toward the viewer and so is the current direction. 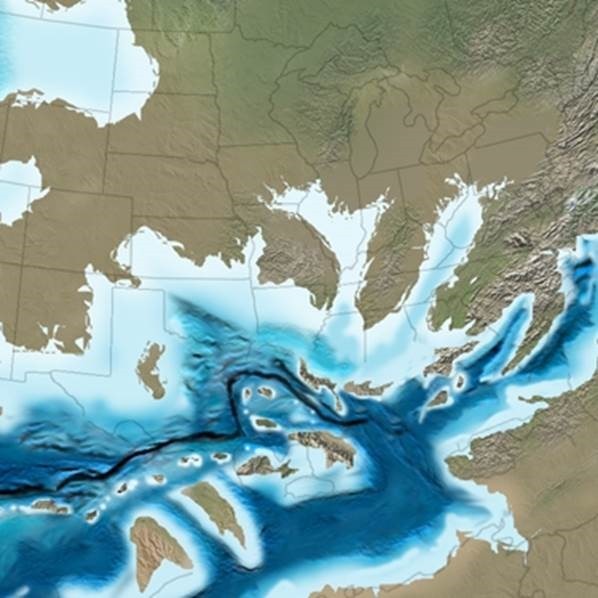 Ripples form naturally by the movement of water currents in rivers and streams, on beaches of tidal and long-shore currents, and in deep-ocean basins. 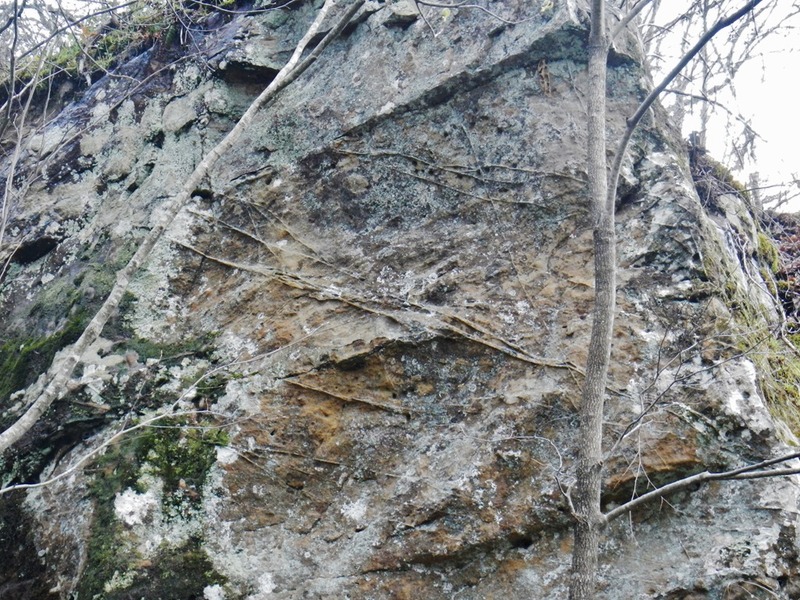 This picture was taken of Ordovician age sandstone in the Everton Formation along Beaver Lake. 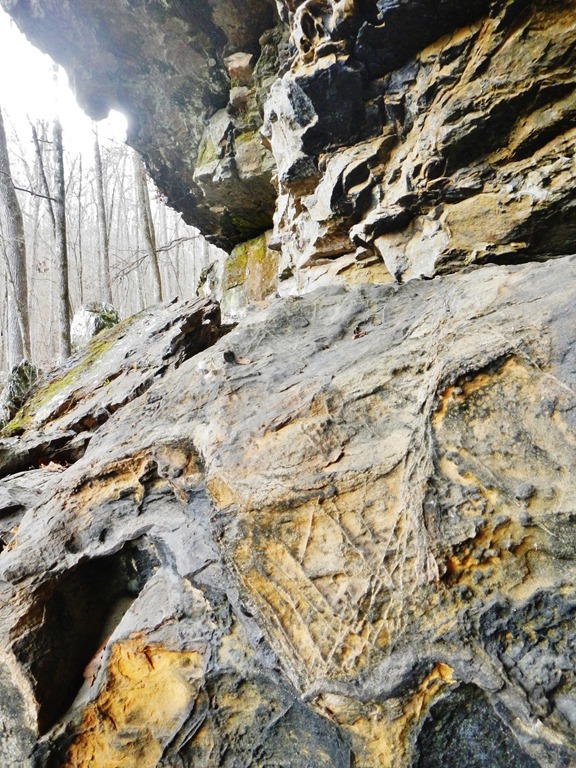 This entry was posted in GeoPic of the Week and tagged Beaver Lake, Everton, limestone, Ordovician, Ripple Marks, sandstone, Sedimentary, sedimentary structure on November 22, 2013 by argeology.